1. Preheat the oven to 180°C, gas mark 4. Grease a non-stick 900g loaf tin with butter. 2. Place the fl our, baking powder and a pinch of salt into a food processor. Add the caster sugar and pulse to combine. Add the butter and pulse until the mixture resembles breadcrumbs. 3. Add the soured cream, egg and vanilla, then slice in the bananas. Whizz until just combined, then add the walnuts and briefl y pulse. 4. Tip into the loaf tin, levelling the surface. Bake for 45 minutes until risen, golden and a skewer inserted into the centre comes out clean. Cool for 10 minutes, then turn out onto a wire rack to cool completely. 5. To make the topping, mix the icing sugar into the soft cheese. 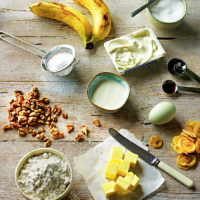 Spread over the top of the cake, decorate with the banana slices and serve. Replace the walnuts with raisins soaked in 1 tbsp dark rum for 1 hour, and use ground cinnamon instead of the vanilla extract. Top with 4 tbsp of your favourite crumble topping before baking. Use chopped dark chocolate in place of the walnuts, divide the mixture between 10 muffi n cases and bake at 190 C, gas mark 5 for 20 minutes.